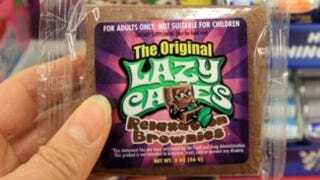 Lazy Cakes! They're brownies, sold in dirty gas station snack aisles everywhere, that promise cellophane-wrapped chocolate relaxation. And by "relaxation," they mean fewer than two of these will make you pass out. I'll take three! The Lazy behind the Cakes is good ol' melatonin. You remember melatonin, don't you? It's the stuff you used to take before long flights and after longer caffeine benders. This particular treat has 8mg of the (FDA unapproved, FDA unregulated) additive, which is just 2mg shy> of being able to make an adult human person abruptly fall asleep. Of melatonin, Dr. Seres warned, "If you take it while you're driving a car, you will find yourself in a ditch."